The data show the drop in those years to be correlated with the shale revolution, as natural gas production increased by a factor of more than 10 and its price dropped in half, the researchers say. And, due to the continuing–and in some cases accelerating–technological and economic advantages of gas over coal, the decline in coal is expected to continue at least decades into the future. "Some people attribute the decline in coal-generated electricity to the EPA's air-quality rules, even calling it 'Obama's war on coal,'" said Mingguo Hong, associate professor of electrical engineering and computer science at Case Western Reserve and co-author of the study. "While we can't say that the EPA rules have no impact–as, for example, discouraging the building of new coal power plants because of the expectation that tougher air-quality rules will clear the courts–the data say the EPA rules have not been the driving force." The authors examined data available from the U.S. Energy Information Administration, academia, specialized energy consultants, and Wall Street analysts and publically available information of the electric utilities and gas industry–in some cases down to the profit and loss statements. "If you're a power plant operator and you see gas supply is continuing to increase and natural gas can do the job cheaper–by a lot–the decision to switch from coal is pretty easy," Culver said. Gas supply continues to grow. Starting in 2009, gas production each year has exceeded U.S. Energy Information Administration (EIA) annual projections. And the proved gas reserves are outpacing production exponentially, the researchers note. Lastly, pipelines out of Appalachia–where the cheapest and most abundant shale gas is found–are expected next year to increase access to gas in that region by 55 percent above recent production. 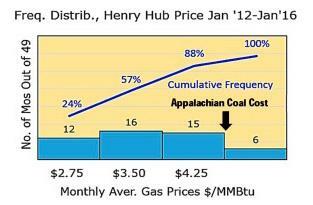 But after reviewing the profit-and-loss statements of gas drillers, the researchers believe that a point of price stability exists where both the drillers can be profitable enough to keep drilling and the price to power plants–particularly for gas from the Marcellus and Utica shale deposits in Appalachia–will still be far lower than coal.